Leslie caught this nice speck while we were on the sand about five miles north of the Convention Center, on the bay side of South Padre Island, Texas. Caught on a topwater MirroLure. NOTE – As you remember, I have always written about the DIY trips we do here in an honest and forthright way. If we catch, we catch. And if we hit a brick wall, we hit a brick wall. The biggest takeaway from this trip is going to be knowledge, which you have to admit is a good thing for the future. I have seen guides, who sponsor trips to exotic locales, try to make a silk PR purse from days (or an entire trip) of being blanked. That doesn’t fly here. Two weeks are almost up, and today will probably go a ways to define this trip. I certainly can’t define it by the weather – stormy then clear in rapid succession, the fish – you see who did the only catching in that image above, or by the stories generated – during off-season, trying to get a hold of people to interview who must live on “Island Time.” If I could define it, I would probably say it’s a little too far off season for a lost son to come back and zero in on fish … I do take comfort in the number of boats I see running the grass flats – maybe a handful a day at the very most. 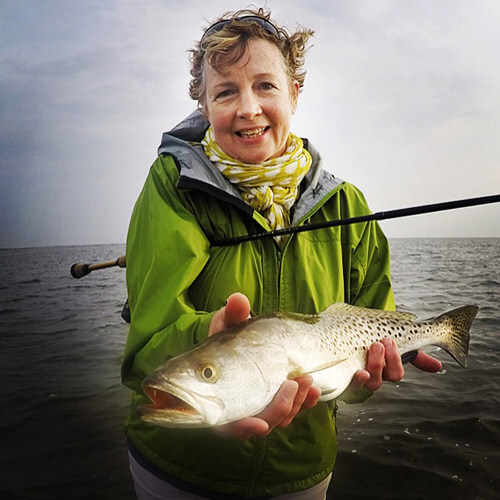 I dropped on the edge of the intracoastal early yesterday, and spent the rest of the day drifting the sand holes in the grass, called potholes – up north, on the bayside sand across from Andie Bowie Park – all to no good, I couldn’t even roust a single frightened fish. I would have to summarize that the cool front pushed them off the flats for more than a day as the water temperature dipped about 3-4 degrees in a day (during the warmest part of the day) from Wednesday to Thursday. And the water was still quite churned from the gale force winds that came with the cool front. The water was cloudy and it looked like the bay grass has been mowed, as it is floating everywhere. I knew from my childhood that boating the Lower Laguna Madre, out of South Padre, is a treacherous affair. There’s a reason why kite surfers and sailboarders come from all over the world to here; the wind howls, but most importantly, it’s shallow for miles and miles. Local boat companies have, as I documented in the past, created boats specifically for running over the grass without touching it. That means wide open and six inches of water. Channels and depth has little meaning for them. Right now, as the Lagoon Skiff is setup, and if I keep the setup* as is, it’s not running wide out in six inches of water. I am very satisfied in how shallow it does run with the way it is setup now, but if I were running here daily the setup* would have to change. *Setup – Motor height in this case, as I already have trim-tabs on her. I hesitate to think about a jack-plate just to run this water, but I do believe what the boat builder, Oscar Weaver (Owner / Builder at Lagoon Boats Cocoa, FL), said about jack plates and tunnel hulls, “a lot of that can be avoided by doing the correct rigging of the boat,” in reference to motor height. That was his response when I was “encouraging” him to build a tunnel for Texas water. I still think a tunnel could be a great change for a Texas boat. One of the key phrases I have zeroed in when it comes to Florida boats (virtually all of them) is, “poles in 6-inches,” whereas in Texas we say, “runs in 6-inches.” Feel Free to Think about that one. What I do now is simply put-put the channel that runs the civilized bayside, out the south end, where it opens up at the causeway (channel runs parallel to the NEW causeway), and then make my EXTREMELY CAUTIOUS move to head south toward the old Queen Isabella Causeway, or to head north along the intracoastal and back (eastward) to the flats once everyone else disappears. Once I am shallow, I cut the motor and drift, or use the trolling motor to drift the (empty yesterday) potholes. You’re going to need electronics out here for charts – because if you’re off by a little, it can hurt a lot. My wife looked at me this morning, over a smoothie and oatmeal, and said, “You think you’re overdoing it a bit?” “Heck yes!” I replied. “You know this was supposed to be a rest and recuperation trip don’t you?” I said there’ll be plenty of time for rest while I drive the 600 miles home from here. Salt is, as always, good for my soul.